Alois Höfler (1853-1928), the Austrian educationalist and philosopher, produced many texts on both psychology and general science and made a name for himself by publishing the Berliner Kant-Ausgabe (1903). 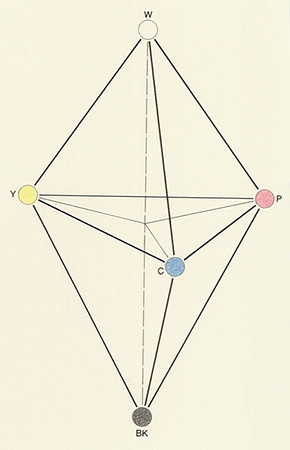 In 1897, his textbook Psychologie appeared, in which he introduced his first colour system — a double pyramid with rectangular base (an octahedron). He later proposed a further, derivative colour solid with a triangular base (tetrahedron). White (W.) and black (BK.) are found at the tips of both constructions, with grey appearing in the middle. Höfler also sought a relationship between the harmony of colours and music. In his books, he explicitly points to the sequence white-grey-black since he discovers here a «quasi-straight line», meaning a straight line limited at both ends. Such a line, however, appears unfamiliar to music and musical notes. The rectangle — the system of four — operates with the four elementary perceived colours: yellow (Y), red (R), blue (B) and green (G). Of these four psychological colours, only the yellow reappears, along with cyan (C) and purple (P), in the artists’ triangle, which thus contains the subtractive primary colours. 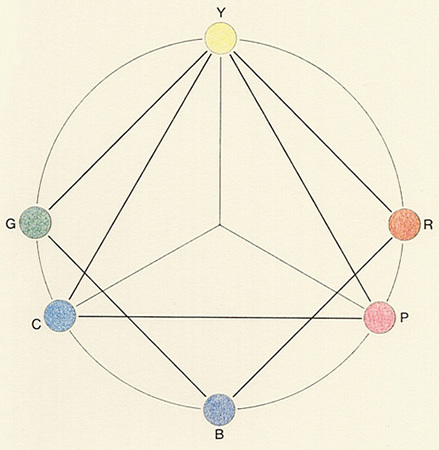 The purpose of Höfler’s arrangement is not to provide an organisational or identification system, and neither does he consider that colour variations can be subordinated, for instance to the geometrical properties of a sphere. He is more concerned with «certain alternative internal relationships» between the colours. 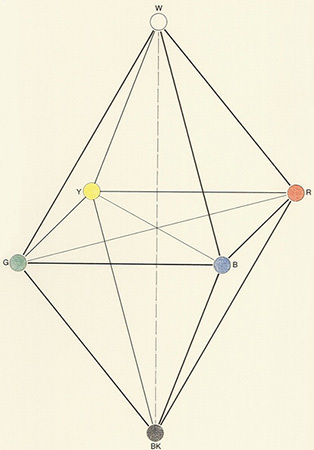 His colour-octahedron not only represents Hering’s basic colours, but also their relationship as opposing colours. Höfler’s solid should be seen as an expression of the relationship between coloured sight on the one hand and the psychological effect of colours on the other. For this reason, many psychological textbooks have adopted his pyramids to provide information on our perception of colours. Starting with the yellow common to both pyramids, we can construct a colour-circle possessing twelve individually spaced segments — the six named colours, in fact, together with the areas lying between them. Date: The Austrian philosopher and educationalist produced two similar colour-systems between 1883 and 1897. Bibliography: Höfler, «Psychologie», Vienna 1897; A. Höfler, «Grundlehren der Psychologie», Vienna 1908; F. Gerritsen, «Entwicklung der Farbenlehre», Göttingen 1984.